The first chapter of the grade eight religion program examines the "We Believe in the Holy Spirit" line of the Apostle's Creed. This mystery of our faith is a difficult componet to grasp, however it becomes comforting once we begin to understand that God is ever-present within us. The Holy Spirit is there to help us pray when we feel too weak to talk to God. He gives us spiritual gifts for serving in the church. He helps us see when we're sinning or heading in the wrong direction. He nudges us to make good decisions and empowers us to live like Jesus. Jesus gave us the Holy Spirit so we wouldn't be on our own as we struggle to follow him. In every trial, every joy, every temptation, every sadness, every celebration, and in every single moment, the Spirit of Christ dwells in us. That's the Spirit the Apostles' Creed is talking about when it says: "I believe in the Holy Spirit." The Holy Spirit lives in our hearts, reminding us of our salvation and helping us to live and love just like Jesus did when he walked the planet. The ways we find and know God change as we change. Apostle: In the new testament, the description of an apostle is that they are the founders of the church. In this definition, apostles do not exist today. In a more casual defintion, an apostle is one who shows leadership in more than one category, such as pastor, teacher, evangelist, etc, etc. In today's church, becoming an apostle would follow years of dedicated service; exemplary lifestyle; committment to community, family, and of course God. What was an Apostle expected to do? The apostles chosen by Jesus were meant to accompany him on his journeys, watch his actions, learn from his teachings, and then eventually carry on for him after he was gone. Catholics regard the apostles as the connection between the living Jesus, the resurrected Jesus, and the Christian church that developed after Jesus ascended to heaven. The apostles were witnesses to Jesus’ life, recipients of Jesus’ teachings, witnesses to appearances of the resurrected Jesus, and recipients of the wisdom of the Holy Spirit. They were authorities on what Jesus taught, intended, and desired. Thus the apostles were expected to spread the news of Jesus' life, death resurection and teachings. Generations of Christians have continued the passing of the traditions and teachings of Jesus' ministry to this day. What is the Apostles Creed? The Apostles’ Creed is not found in the Bible. The Apostles’ Creed was not written by the apostles. Rather, it was written at least 150 years after the apostles had all died. It is called the Apostles’ Creed because it is supposed to be a record of what the apostles taught and forms the fundamental tenets of Catholic belief. Today the class discussed questions surrounding the Apostles and the Apostles Creed. We examined the roles of the Apostles and who takes on the role of teaching us about Christianity in our early life (parents, priests, teachers, community of believers etc.). WHAT DO THEY EXPECT ME TO DO NOW? 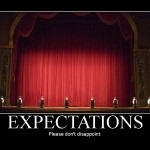 Expectations: A belief that someone will or should achieve something. Pentecost: Pentecost is the great festival that marks the birth of the Christian church by the power of the Holy Spirit. Pentecost means "fiftieth day" and is celebrated fifty days after Easter. For the next few lessons we will read an imaginary student journal about the expectations he/she had for his/herself and what others had for him/her upon entering grade 8 (on page 6 of the text). We will also discuss the reflection questions on page 7 and emphasize that "expectations" need to be realistic in terms of what we can expect from ourselves and others. We will follow this up by looking at the "Great Expectations" Jesus had for his Apostles after his death. We will read (and discuss) the "Pentecost Story", watch corresponding video (see below) and complete a followup activity page about the story. Sometimes expectations can be difficult because we feel weighed down by them. At other times we may be burdened because we feel that our expectations of ourselves (and others) are too low. The weblink below demonstrates the feelings of a young man (Jason) who is grappling with his mixed emotions about "expectations". He shares a lot of emotion, and there is some excellent spirituality in his message. Definitely worth a read. "God's holy fire (is in) every tribe, every tongue, every nation. A love song born of a grateful choir". So what exactly is the Holy Spirit? What can I expect the Holy Spirit to do for me? What does the Holy Spirit expect of me? These are weighty questions that can only be answered when one does some inner "soul searching". The following clips help to provide some answers to these questions. "God wants us to live a spirit-filled and a spirit powered life." We have everything we need in us to make this happen. Enjoy! The students were asked to complete a journal in their religion notebooks where they reflected on expectations they have as young Catholics in todays fast paced world. What does God expect of them? What do they expect of God? When we 'expect' to fail we often will. If we perceive things in a negative way, it can be difficult to change our perception unless someone (or something intervenes). 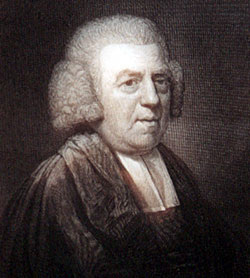 Take the case of John Newton (see picture). Mr. Newton was a slave trader in the late 1700's. He was not a religious man, and considered slaves to be barbarians and thus saw nothing wrong with taking them from their homeland and trading them for his own financial gain. It was on one of his slave trading missions that Mr. Newton underwent a "conversion of his spirit" very similar to Ebenezer Scrooge in A Christmas Carol. So powerful was his change of heart that he documented it in the famous hymn "Amazing Grace" that has now become one of the most inspirational songs in the Christian faith. The point here is that when we expect little from God, and deny His inclusion within our life, there is little wonder that we are not happy. When we mistreat others (or ourself) we are travelling away from the path of light into darkness (and ultimately for many unhappiness). Mr. Newton (and Ebenezer Scrooge) found that embracing God's grace was much more fulfilling. Hopefully, we will also make this choice during our life time. Today students were asked to read the story "You Won't Like Me" (pages 11-12 of Stand By Me textbook) and complete the Reflection Questions on page 12 #1-7. 1. Wisdom helps us recognize the importance of others and the importance of keeping God central in our lives. 2. Understanding is the ability to comprehend the meaning of God's message. 3. Knowledge is the ability to think about and explore God's revelation, and also to recognize there are mysteries of faith beyond us. 4. Counsel is the ability to see the best way to follow God's plan when we have choices that relate to him. 5. Fortitude is the courage to do what one knows is right. 6. Piety helps us pray to God in true devotion. 7. Fear of the Lord is the feeling of amazement before God, who is all-present, and whose friendship we do not want to lose. Today I started the class by doing a "Gifts of the Holy Spirit Activity". We finished the discussion about the Gifts of the Holy Spirit by reading a passage from the Stand By Me entitled "Strong Enough" (pages 15-18). The students completed the Reflection Questions page 18 #1-3. 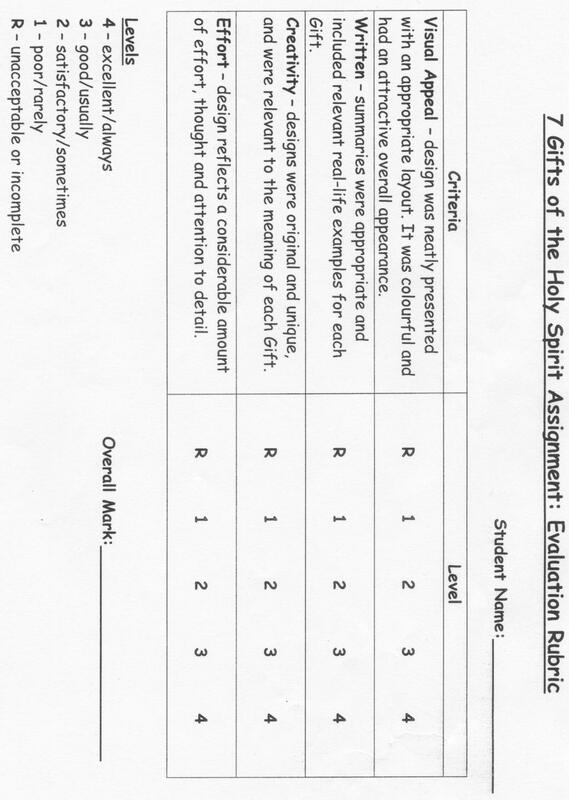 Today the students were given an assignment to check their comprehension of the Gifts of the Holy Spirit. To see the criteria for the assignment see the file below. There are many credible websites that the students can use to find information and potential images for symbols. Some caution needs to be exercised when selecting pertinent websites. When we talk about the "gifts of the Spirit," we are talking about the "talents" and "attitudes" which God gives us that make it possible for us to do God's will. When we talk about the fruits of the Holy Spirit, we are talking about the blessings which come to us because we have done God's will. Today we read the Parable of the Talents (Matthew 25:14-30; Luke 19:12-28). After a brief historical review of what a "talent" was (money) in ancient lore, we discussed the simple analogy Jesus was making to our responsibilities to use the gifts God has entrusted to us while we are on the Earth. We also discuss the clear message from the parable about the outcomes for those who use their "talents" and those who don't. On top of this, we listed the 9 Fruits of the Holy Spirit and did a self evaluation of how many of these fruits we feel regularly in our lives. When one or more of the fruits of the Spirit are missing from our lives, we are out of balance and unable to live as fully as God wants us to live. We live in solidarity with others when we see their needs as our own needs and their hopes as our hopes. We live in solidarity with others when helping make their dreams come true is as important to us as helping make our own dreams come true. We live in solidarity with others when their successes are our successess and our successes are their successes, and when their failures are our failures and our failures are theirs. Solidarity leads to win-win situations. 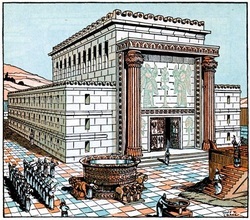 Today the students read the legend of how God selected the perfect location for Solomon to build the Temple. He found a spot where two brothers lived in solidarity with each other; a place where each brother displayed a sense that the other's needs are more important than his own. The students were then asked to complete Reflection Questions #1-4 on page 27. "One of the greatest mysteries of our faith is the existence of the Holy Trinity. The three persons of the Trinity are one God and thus the perfect example of solidarity to us. Whenever one is present, God is present. The presence of the Holy Spirit in each one of us means that God is never separated from us. We can bring God to others through our relationships. When our relationships are built on solidarity instead of power, they reflect the Trinity and God is present." "God the Father is the mouth. The Word He speaks is Jesus the Son. And the breath He uses to speak is the Holy Spirit. The Father is the idea. The Son is the Word telling about the idea . And the Spirit is the action that puts the idea into practice. Tell children to think of a word. Then holding their hand in front of their mouth, speak the word. The "thought" I compared to the Father. The "spoken word" I compared to Jesus Christ, the Son of God. And the breath they felt on their hand, I compared to the Holy Spirit, the breath of Life that carries the spoken word out through us." Today we read a hypothetical conversation (pages 27-31 of Stand By Me textbook) taking place in an empty church. Various symbols of the church (cross, holy water, candle and a stained glass window) discuss and try to comprehend the Trinity. In the end, they come to the realization that it isn't until we learn to see the Holy Spirit in ourselves (and in those around us) that we will know and see Jesus and the Father. We followed this up with a reflection about a young lady who truly lives in solidarity with others: Sonia: A Story of Solidarity from the textbook (page 31 - 32). The students were then asked to complete the Reflection Questions on page 32 #1-4. Over the past 6 weeks we have investigated many ways in which the Holy Spirit guides and supports us on our journey through life. As long as we open up our hearts and let the Spirit in, we are never alone - God lives in us and works through us. We discussed places that we can expect to from God and what God expects of us. We looked at the Pentecost story, and the spread of the early Christian church. We summarized the "Gifts of the Holy Spirit" that we receive after confirmation,what God expects us to do with these "talents" and how we can recognize these Gifts in others. We explored the "Fruits of the Holy Spirit" and how the presence of these in our life reflect that we are "on the right track" and are correctly utilizing the Gifts as God intended. We finished by discussing solidarity with our neighbours and the perfect model of solidarity, "The Holy Trinity." The following song helps to show us that sometimes we need to look beyond ourselves to "see" the problems that exist for people around us. If we have the courage to take a step to help, we begin to show how to live in solidarity. God Bless!